Learning about cataract surgery complications is important, because just like any other surgery, cataract surgery comes with inherent risks and side effects of its own. Ocular pressure fluctuations, loss of vision, and bleeding are some of the possible side effects of the cataract surgery procedure, but only about 5% of cataract surgery patients develop such complications. After cataract surgery, doctors often provide tips that are designed to prevent post surgical problems and these need to be followed religiously. To stay safe, you’ll have to be aware of common cataract surgery complications that patients face, and these have been given below. In rare cases, patients experience posterior capsular opacification, also known as the after-cataract. This condition brings about the opacification and smudging of the posterior lens, leading to reduced visual acuity. This problem can be addressed by making small holes using laser treatment. Posterior capsular tears or ruptures may occur too. In such cases, a tear develops in the postular capsule natural lens. Retinal Detachment is a possible complication, though it is extremely rare. This can happen at any point of time, even after years. It takes place when aqueous humour, the fluid within the eyeball, permeates through a small tear. Glaucoma, usually associated with inflammation, is one of the possible cataract surgery complications, and this condition might be difficult to address. Many surgeons recommend early intervention for glaucoma, because there have been rare reports of glaucoma resulting in high ocular pressure, leading to blindness. Macular Edema is the distension in the central region of the retinal membrane. This is a possible after effect of the operation and can result in moderately distorted central vision. Patients who suffer from high blood pressure or acute cases of glaucoma are prone to choroidal hemorrhage or bleeding from the choroids, a gossamer network of blood vessels, during the operation. 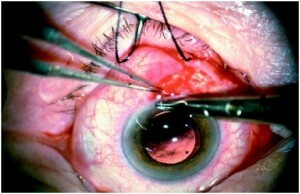 Choroidal Hemorrhage might interfere with post surgery vision, but minor instances can be resolved with modern surgical techniques. 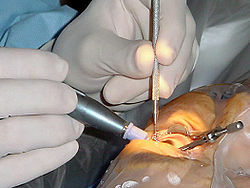 In a few cases, sutures might be required to seal off small leakages in the corneal discission. This might result in astigmatism due to distortions in the cornea. These defects disappear over time if they are caused by an edema of the membrane or after the stitches are removed. 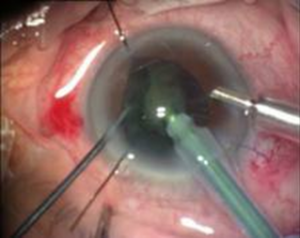 Rarely, cataract surgery patients might develop infections in the intraocular tissues. This condition is called Endophthalmitis and it can result in turgidity, pain, and in some cases, partial reduction of eyesight. It is imperative to weigh your options and consider all the risks involved right before the surgery. Keep in mind, though, that doctors will be able to help you counter most of the cataract surgery complications. To understand the post procedural care you should take up after cataract surgery, you need to know about the cataract surgery procedure first. When the natural lenses of the eyes develop an opacification, called a cataract, it has to be removed surgically. This opacification develops over a period of time, due to metabolic changes of the crystalline lens fibers. The affected lens is replaced with a synthetic lens during cataract surgery. Cataract surgery is usually performed by an ophthalmologist in an ambulatory setting using local anesthesia in most cases. During this procedure, an Intra Ocular Lens, called the IOL, is implanted. Soon after cataract surgery, care must be taken to keep the eye area clean, with regular application of the prescribed eye drops. Apart from this, other post procedure tips should be followed in order to prevent cataract surgery complications. Though the eye would have recovered in the first few weeks, the brain might need a little longer to adjust to the improved vision. It might take 4-8 weeks for the brain and the eye to reconcile and work with each other. By the end of six months, you’ll be able to optimally use your eye. You should ensure that you get your eye checked annually. Practicing necessary caution after cataract surgery will ensure your speedy recovery and help you attain better eyesight. Cataract surgery is necessitated when the natural lenses in the eyes become opaque due to metabolic changes over time. The cataract surgery procedure is a simple one that is performed by an ophthalmologist in a sterile clinic, in order to avoid cataract surgery complications. During the actual surgery, the surgeon will normally remove the damaged and cloudy lens and insert a synthetic lens that can help restore vision. Most patients who undergo the cataract surgery procedure report little or no discomfort during the actual surgery. This is mainly because the surgeon and the anesthetist will decide on the kind of anesthesia to be administered, making an effective choice that will put the patient at ease. When the patient is being prepped for the eye surgery, the following actions will be carried out. Once the patient is taken to the operation theatre, a cannula is inserted, usually in a vein in the wrist or the back of the hand. A pulse oximeter and a heart monitor may also be used to monitor the patient, along with a BP monitor in case general anesthesia is used. Local anesthesia can also be used during the cataract surgery procedure, including types like topical, peribulbar and retrobulbar, which ensure minimal discomfort. During the cataract surgery procedure, the patient is kept at a reasonably reclining state, and the surgical staff members ensure that the face is level to provide better accessibility to the surgeon. The area surrounding the eye is cleansed and a sterile drape is placed around the eye. An eyelid clip or a speculum is used to keep the eye open during the procedure. In most cases, the surgery takes close to 15-20 minutes. A microscope is placed about 25 cm from the eye, to provide proper illumination and visibility during the cataract surgery procedure. The discission is performed near the limbus, which is where the cornea and sclera meet. Minor incisions are made, to avoid the need for sutures and reduce the recovery time. The affected lens is first removed, and this process is also called phacoemulsification. An intraocular lens (IOL) is then inserted and the surgeon checks for fluid leakage after the insertion. Sometimes an antibiotic might be administered during the cataract surgery procedure to prevent any inflammation or infections. During the IOL implant, the surgeon might use monofocal, toric, or multifocal intraocular lenses, depending on the patient’s requirements. Monofocal lenses are the most commonly used lenses these days. Toric lenses are used to correct astigmatism and multifocal lenses provide better vision, though they can cause more glare than the other two lenses. Surgeons choose the right lenses based on their suitability and reliability. Care should be taken after cataract surgery to maintain good vision.